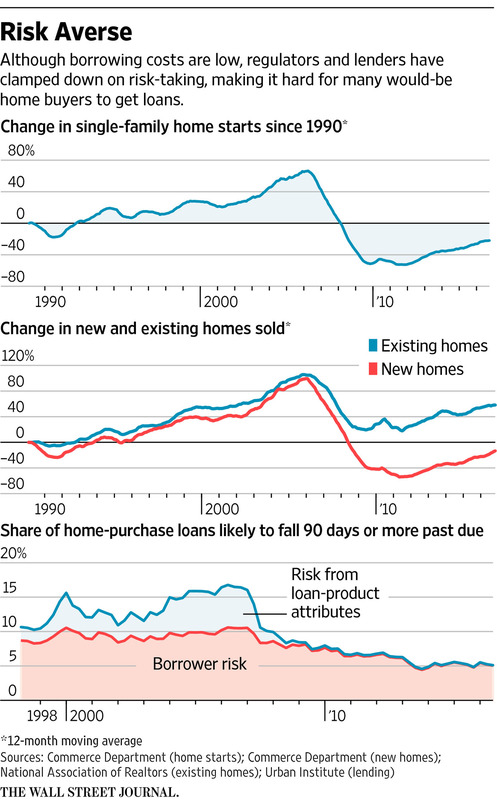 The result is that lending for housing, a pillar of the U.S. economy, has bifurcated. Well-off households and home builders have their choice of loans, while many others without solid credit or stable incomes are locked out.That dynamic is one reason the U.S. has seen such anemic economic growth despite aggressive efforts to encourage investment. Money has been cheaper and more abundant than ever, but—for some—much harder to get. Single-family home construction accounted for 2% of gross domestic product, on average, during the 1990s. It has averaged just 1% of GDP since the recession ended in 2009.